Price is for a pair (2) front turn signals in white (clear) for your 1993-1996 Supra. 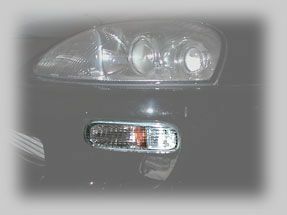 These factory style lights are the larger clear front turn signals which you see on the 97/98 Supras. They are a bit larger than the previous years, but fit perfectly after mounting. Harness kit is offered in our drop down menu. These are a standard upgrade for all Supra owners, giving your car that modern updated look for a very fair price. Picture shows 98 turn signals installed on a 1994 Supra. These will require you to buy the 97-98 front turn signal harnesses or just a simple custom mount for them in place for the 93-96 Supra's. Not too difficult to do at all; please feel free to call if you have any questions. Thanks.